Right-clicking a selected Region reveals a context menu. The first item in the menu (labeled with the Region's name) contains a large sub-menu. This section describes a few of the most commonly used operations accessible from this menu. The Rename function lets you change a Region's name. 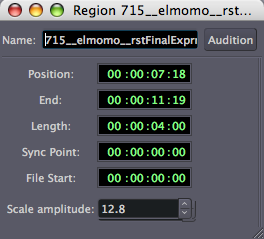 The Region Editor is a powerful menu which can be used to Audition the Region (see below), change the Position of the Region in the Timeline, Trim the length via the File Start and Length values, and Scale amplitude of the Region. Further down in the menu, the Audition option plays the Region back via the Audition Bus. See the chapters on Understanding Routing and Starting JACK to learn how to change the routing of the Audition Bus. 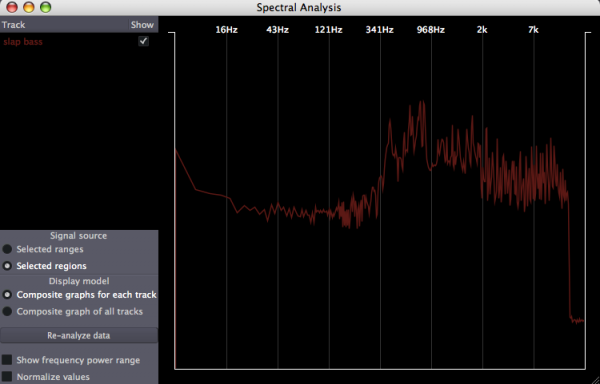 Clicking the Spectral Analysis function opens up a new window which displays the overall frequency content of the Region. The Lock toggle box locks the Region so that it cannot be Moved or Trimmed. It can still be Split, however, and the resulting Regions will be unlocked. The Mute toggle box renders the selected Region silent. The Transpose function alters the pitch of a Region without changing its duration. The function applies a pitch-shifting algorithm to create a new audio clip based on the source clip. When the transpose item is selected, a window opens allowing the user to specify the amount and direction of pitch shifting desired. The window includes a Preserve Formants button. When pitch shifting by large amounts, the Preserve Formants option can give results that sound slightly more natural, particularly when used on vocal material. The Transpose function can also be entered by pressing the F5 key. The Normalize function non-destructively boosts the level of the selected Region so that the Peaks are at 0dB. In other words, it makes the region as loud as possible while avoiding Clipping. The boost applied when a Region has been normalized can be reversed by selecting DeNormalize menu item. The Reverse function reverses the selected region of audio, in effect causing it to play backwards. Reversing a region creates a new audio file 'behind the scenes'. The Trim function trims the Region in a number of ways, including from the Start to edit point and Edit point to end (see previous chapter for a discussion of Edit Points). The Make Mono Regions function splits a stereo Region into two mono Regions which can be accessed via the Regions Tab at the far right of the Editor Window. Duplicate, Multi-Duplicate and Fill Track are methods to Duplicate the Region. Please see the chapter Creating Looped Sections for a detailed discussion of these. The Remove function deletes the selected Region from the Track. The Region remains available from the Regions List at the far right of the Editor Window, so it can be brought back into a track at any time by dragging and dropping. 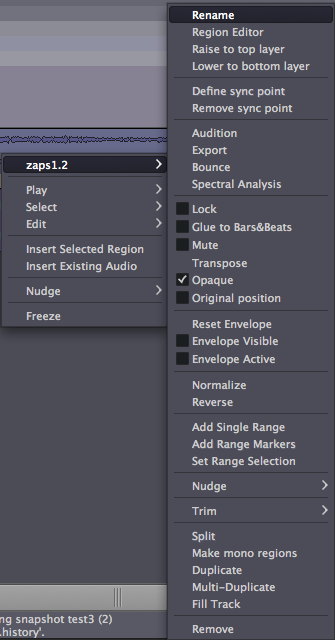 In the following chapter, we will learn a bit more about the powerful tools Ardour has available by Changing Edit Modes.